U.S. trailer orders in December plummeted to 27,800 units, off 40% compared with 45,802 a year earlier, reflecting lengthy backlogs and in some cases cautious fleets, ACT Research Co. reported. Nevertheless, full-year orders scored a record after topping 400,000. “At this point, for as long as the order stream has progressed since the fall of 2017, it may not have been as much of an unwillingness to order as, ‘we’re done, we’ve taken our position,’ knowing the order boards are full,” Frank Maly, director of commercial vehicle transportation analysis at ACT, told Transport Topics. At the same time, “How solid is a fleet’s perception of need that far out, particularly with two kinds of conflicting things we see playing out as the year progresses?” he asked. On one hand, the robust backlog will deliver new equipment but the economy is signaling slower growth, particularly later in the year in the housing, manufacturing and auto sectors — “pretty significant freight generators,” Maly said. June marked the only other year-over-year decline for 2018, but the difference then was slight, just 379 units. The year’s total of 420,000 orders set an all-time annual record — up 35% from 2017, according to ACT, which cited preliminary numbers it would revise when final data is available. Refrigerated trailers posted an industry-leading leap of almost 90% versus 2017. The research firm FTR pegged December orders at 28,000 units. “Most of the big fleets already have their requirements orders in for 2019. Now the medium and small fleets are searching for the remaining build slots, based on their expected needs in the second half of the year,” FTR Vice President Don Ake said. He suggested those fleets could be placing orders through dealerships. “This is a valid strategy in times of tight supply, but there is no way to determine how widespread it is or to quantify it,” Ake said. Meanwhile, most customers seem to understand the reality of the situation this year when it comes to vans and refrigerated trailers, which make up 75% of the trailer build, said another trailer maker executive. 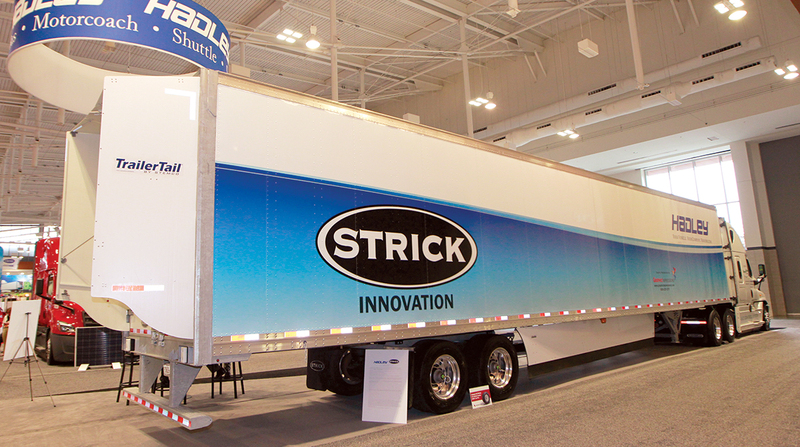 “They have given up trying to place additional orders for the remainder of the year, even if they have a strong need,” said Charles Willmott, senior vice president at Diamatrix — the holding company for the Strick, Evans and Cheetah brands of trailers and chassis. “I am honestly surprised that December numbers were as strong as they were,” he said. Other trailer makers, sitting on jammed order boards, said the decline in December was not worrisome. “It’s simple, really. The massive order intake in the prior months and the long lead times we are currently experiencing combined with the limited production availability caused the drop in December,” said David Gilliland, vice president of national accounts at Great Dane. Another trailer maker executive agreed there were few cancellations. “What we see is dealers and trailer lessors changing stock orders to orders based on customer specs, but no outright cancellations,” said Stuart James, chief sales officer at Hyundai Translead. Pricing uncertainty also remains an issue. Gilliland said for Great Dane, it is too early to take firm orders for 2020. Maly added there are “not a whole lot” of extra stock components available to drive up production rates that are “pretty close to peak” levels already. “It’s the challenge of the availables — available components, production capacity and labor,” he said.